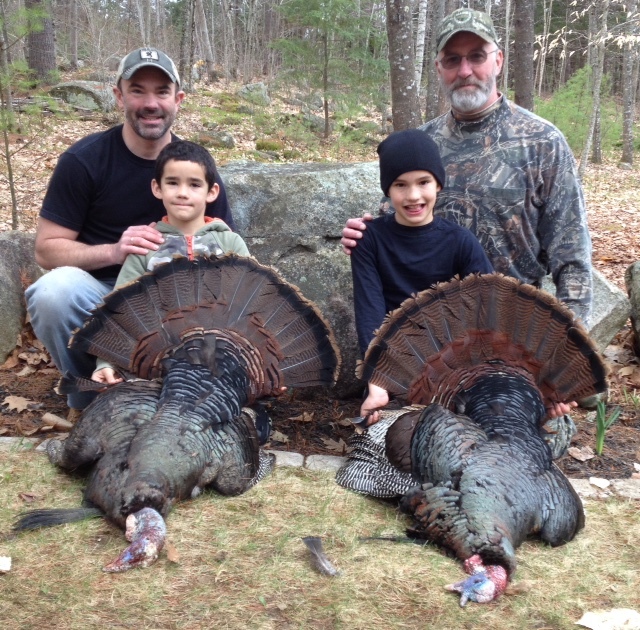 Last turkey season, my sons, the Wildman eleven and Manimal nine years old, both harvested a tom turkey on youth day. Both birds were impressive specimensin their own right with one bird sporting a 10.5 inch beard and the other 1.5 inch spurs, each were just shy of 20 pounds, true trophies any sportsman would be happy to harvest. My youngest sat with me and shot his turkey in less than ten minutes, while my eldest sat with his Grampie and had to wait an excruciating long hour and fifty minutes. These gifts from the heavens didn’t just happen, they happened because I spent weeks scouting and tracking turkey movements with game cameras to lock down a solid knowledge of their daily patterns. I noted that these particular toms were strutting through our woodlot about every other day approximately between 7-9:00 am. With young kids, 2 hours is about all their attentions spans can handle, after that they are spent and the downward spiral to not having a good time begins. Note that this timeframe can be stretched with chocolate and good reading materials! Knowing that I had a small window of attention, I rolled the dice, got the kids up much later than on a normal turkey hunt and crossed my fingers. Lady luck smiled on us, however, and my son and I managed to squeeze into the blind right just before a huge gobble erupted in the woods only a dozen yard from where we were sitting. I clucked once on the slate call and the gobbler ran into the small field where we were sitting. Manimal raised his shotgun and BANG it was over. After the shot, Manimal turned, looked me in the eye and said, ummm, ummm I do love me some smoked turkey. I laughed so hard, I nearly had an asthma attack! Grampie and Wildman heard the shot but due to faulty cell reception didn’t know we had shot a bird till 9:00 am after Wildman had harvested his bird. When I asked Wildman what he remembered about the excitement of that huge tom strutting into the decoys, he said it was Grampie saying repeatedly in a low whisper, “Please don’t shoot my decoy”. Grampie was apparently a little nervous that perhaps the young shooter would “smoke” his $125 AvianX decoy! Well, fortunately Wildman’s shot rang true, the big tom dropped in his tracks and no decoys were harmed. The entire family gathered to celebrate the boy’s turkeys and another valuable hunting experience was added to the boy’s lives that will hopefully foster their love of the sport and help to carry on the tradition of hunting forever. My bird last season was a young jake that I harvested after about two weeks of dragging myself through the tick infested wood. As “senior” hunters, sometimes it’s important to make sacrifices in order to ensure the next generation of hunters continues to carry the torch. I’ll admit it; I am a full blow turkey hunting gear junkie. Every spring I anxiously await the arrival of the “Turkey” catalog from Cableas and spend hours longingly thumbing through every page. While some of the items appear as gimmicks, like the Flextone “Funky Chicken”, other products like the DSD Strutter Tom seem so real that I would be afraid to hunt in its proximity for fear of someone shooting it and me! Hunters looking for a bargain, let me just say that I have a $120 DSD Hen and a $39 Flextone Hen and I can’t tell the difference between the two decoys. Do not however be fooled by other companies that sell decoys in the same price range as Flextone, most of what is being sold is terrible, the realism simply cannot complete with DSD, AvianX and for the budget wise, Flextone. Every year turkey hunters miss what should have been an easy shot. This regrettable situation can be avoided by knowing well the operation, range and pattern produced by their shotgun. To accomplish this task safely, first select a gun range or one of the many large open gravel pits that exist around the state. In central Maine, finding a place to pattern a shotgun can be a challenge. Fortunately in the Augusta area, the Summerhaven state owned shooting range is a viable option. Individuals wishing to use the range should be aware that it is staffed by volunteers and only open during set hours. These times of open operation can be found on the Inland Fisheries and Wildlife (IFW) website. Be sure to practice shooting from a sitting stance, as this will likely be the same position used while targeting turkeys in the field. Targets depicting a turkey’s head and neck are great for these practice sessions (these targets can even be download from the web and printed off). At the range, pace off 40 yards and examine the number of pellets that hit the target in the “kill” zone. Multiple pellets mean dead bird. If this is not happening consistently, Google search “Turkey Gun Patterning Made Easy by Realtree”, this article provides a lengthy listing of suggestions designed to help ensure you and your shotgun are ready for turkey season. When in the field pace off 40 yards and mark it with three sticks, making a half circle directly in front of you. Put decoys out at about 20 paces or approximately in the center of this ½ circle. This setup helps accurately calculate the distances and practically ensures that any turkey entering this defined space will be critically hit. Prime turkey hunting locations exist throughout central Maine, but posted lands are making access harder and harder to find. Frye Mountain (DeLorme’s The Maine Atlas and Gazetteer (MAG), Map 14, A-2), Ruffingham Meadow (Map 14, B-2) and Alonzo Garcelon (Map 13, C-2) WMAs all provide hunters, willing to walk, healthy populations of birds. In the WMAs do not limit hunting to the areas close to the road and the open fields at Frye Mountain, as these are heavily hunted. Instead, better hunting options exist on old skidder roads and trails that funnel birds into effective range. After locating that perfect hunting spot, plan to hunt on weekdays, rather than Saturdays. Hunting pressure is lighter during the week, reducing potential conflicts with other hunters. Nobody wants to go through the heart wrenching dilemma of arriving at their prime hunting location, only to find someone already parked there so find multiple locations in which to hunt, should your first or even second choice become compromised.